Held in a beautiful grand ballroom there will be music from some of SL's best DJ's, Random merchandise and $10K in cash prizes given throughout the night by our sponsors. Balloon drop and fireworks at midnight. 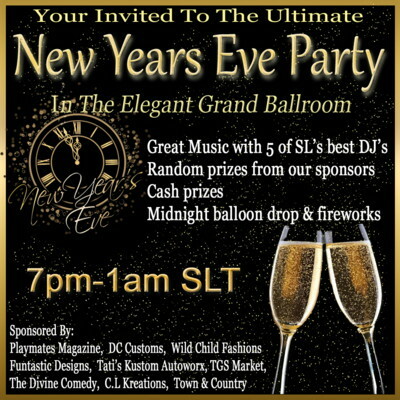 The champagne will be flowing so invite all friends and ring in the new year in style. Sponsored by Playmates Magazine, Wild Child Fashions, DC Customs, TGS Market, Tati's Autoworx,Town & Country, The Divine Comedy, Funtastic Designs and CL Creations.